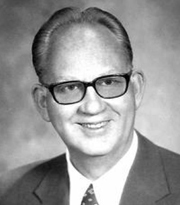 The "Music Man" Edward Arthur Sandgren, 94, passed away on November 27, 2008 in Provo, UT, due to incidences of old age, surrounded by family members. He was born June 18, 1914 in Provo, UT to George Edward and Amy (Swenson) Sandgren. Edward grew up on University Avenue in Provo with two siblings, Clyde and Laraine, and Buddy, his beloved German Sheppard. His good Swedish mother loved his voice and taught him to sing which became a lifelong pursuit. He attended Provo High School and participated in band and chorus and played basketball, tennis and was on the swim team and received a music scholarship to Brigham Young University. One day at BYU, he heard a young lady with an angelic voice singing in a practice room and, feigning no knowledge of music, introduced himself to Ruth Tillotson. The next day when Ruth attended the first day of chorus she discovered Edward was the assistant music director! When he asked her out on a date she was so angry at him for pretending not to know anything about music she turned him down.With perseverance, he finally got her to go on a date and the rest is history. Edward married his sweetheart, Ruth, on August 25, 1941 in the Salt Lake LDS Temple and they were blessed with five children who love and honor him. With a degree in Music Education and a minor in Political Science, Edward and his new bride moved to New York City with the intent to follow in his brother's footsteps and go to law school at St. Johns University. Plans changed as the United States became more involved in World War II and Edward received pressure to obtain a civil service job to assist in the war effort. He and Ruth once again drove across the country to southern California to work at Lockheed and eventually Hill Air Force Base in Clearfield, UT doing airplane maintenance work. Following the end of the war he took his first teaching job in Cedar City, UT at the College of Southern Utah. He eventually ended up teaching music at Ben Lomond High School in Ogden, UT and Orem High and Mountain View High Schools in Orem, UT. Wherever Edward lived, he organized civic choirs, ward choirs, and also did solo work. He was particularly proud of the Cedar City Lions Quartet he organized and directed, which traveled to Atlantic City to compete at the Lions International Convention Quartet Competition, where they took first place. He made lasting impressions in both Cedar City and Ogden, UT in founding The Master Singers and The Ogden Chorale. Ultimately his greatest work and satisfaction was derived in teaching young people in the high schools to love and appreciate wonderful choral music. He is a beloved choir teacher. His choirs received invitations from Utah and national organizations to represent them from coast to coast and internationally. Many of his students fondly remember performing at the Kennedy Center for Performing Arts in Washington D.C.
Edward received many honors and recognition, including: a Biennial Scholarship to the Berkshire Music Center at Tanglewood, MA; the BYU Emeritus Association Special Recognition Award; the Outstanding Educator Award as part of the America's Freedom Festival; and the Arthur V. Watkins Cultural Arts Award.Perhaps his greatest honor came at the frail age of 91 when he was invited to lead current and former choir students in singing his signature "Battle Hymn of the Republic" at Orem High School's 50th anniversary celebration. Music was certainly Edward's love but he also enjoyed BYU sports and held football and basketball season tickets for many years. He rarely missed a televised football game including the last BYU-Utah game. Edward was a High Priest in The Church of Jesus Christ of Latter-day Saints and a most faithful Latter-day Saint. He dearly loved his family and provided a spiritual foundation for generations to come. He taught the gospel of Jesus Christ to thousands throughout his life through sacred music and example. Of course he enjoyed visits from his family but nothing seemed to brighten his day or cheer him up more than a former student recognizing him or visiting him at his home. Survivors include his wife Ruth of 67 years; five children, Rene (Edward) Graves; Arthur (Carol) Sandgren; Lucille (John) Blake; Charles (Mignon) Sandgren; David Sandgren; 28 grandchildren and 30+ great grandchildren. His brother, Clyde D. Sandgren and his sister, Laraine Sandgren, preceded him in death. Funeral services will be held on Friday, December 5, 2008 at 11:00 a.m. at the Oak Hills Ninth Ward Hillside Chapel, 1960 N. 1500 E. Provo, UT. Friends, former students and family may call Thursday evening, December 4, 2008 from 6:00-8:00 p.m. at Sundberg-Olpin Mortuary, 495 South State Street, Orem, UT and Friday from to 9:30-10:30 a.m. at the church. Burial will be in the Pleasant Grove Cemetery.